Recipe video above. 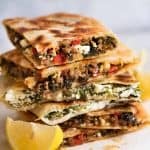 Crispy Turkish flatbreads stuffed with juicy fillings! Choose ONE Filling - either Spinach and Feta, or spiced Lamb OR Beef with spinach and peppers. Can stretch to 5 gozlemes. Works with GLUTEN FREE flour too! Fit stand mixer with dough hook. Mix for 2.5 minutes on medium high speed 7 until smooth (see video for before & after). (Note 4) Dough should be a pliable, smooth ball, not sticky. Sprinkle work surface with flour. Cut dough into 4 pieces. Roll out into 35cm/14" x 20cm/8" rectangle. Make EITHER the lamb / beef Filling, or Spinach & Feta (or make 1/2 batch of both!). Cook garlic and onion for 1 minute. Add capsicum, cook for 2 minutes. Add beef and cook until it changes from pink to brown, breaking it up as you go. Add cumin, paprika, cayenne (if using), salt, pepper and water. Cook for 2 minutes. Place spinach, garlic, egg and pepper in a bowl. Scrunch with hands to reduce volume and make spinach "floppy". Add feta and stir through. Spread Filling on half the pastry, pushing to the edge. Sprinkle Lamb/Beef Filling with crumbled feta. Sprinkle Spinach Feta with mozzarella cheese, if using. Fold other side of pastry over to cover Filling. Press down edges, pressing out excess air pockets trapped inside as you go. Use water if needed to seal well. Sprinkle flour on a round pizza paddle (or similar). Slide gozleme onto paddle. Slide gozleme into skillet. Cook, lightly pressing down (including edges), until deep golden and crispy - about 3 minutes. Flip and cook, pressing down lightly, until crispy. Transfer to cutting board. Cut into 6 or 8 pieces. Serve immediately with lemon wedges, if desired. 1. Filling - choose either Spinach Feta OR Spiced Lamb/Beef. Filling is enough to fill 4 gozlemes. OR make a half batch of each which is what I usually do - use recipe scaler to scale ingredients down (click on Servings and slide down until beef reaches 250g/0.5lb and everything will change). 2. Danish Feta - a soft feta that is like a cross between greek feta and goats cheese. Ideal for Gozleme but normal feta totally fine. 3. Mozzarella cheese - not usually in Gozleme so it's optional. But I can't resist! 4. Dough - Soft, pliable but not sticky - very easy to handle. Adjust with sprinkle of extra flour or water if needed to achieve consistency shown in video. Hand kneading - about 6 to 7 minutes. Gluten free flour - works great! Dough is not as stretchy, it's more like short pastry (like Quiche, see video). Also recommend making 5 smaller ones rather than 6. Pastry does not brown as well, but flavour and texture is the same! Cooked gozleme should be eaten asap while hot and crispy! 6. Pastry and fillings adapted from this recipe from Gourmet Wog. It's the one I've been using exclusively since I found it. 7. Calories per gozleme - Spinach and Feta. There's a fair amount of olive oil in Gozleme, but remember olive oil is better for you than other oils! Don't be tempted to cut down on the fat in the pastry. But you can cook with less - spray a non stick pan.